Hello again everyone! I’ll just let you know that the subjects of my posts may be all over the place sometimes, so unless I mention it on another post then the next post won’t be on a particular aspect of game design or even Streets of Peril. Anyway, onto this week. I finished my finals and presentations for my senior project and I have over a week off from school. I spent the past few days working on a new feature that I think will prove beneficial for Streets of Peril. 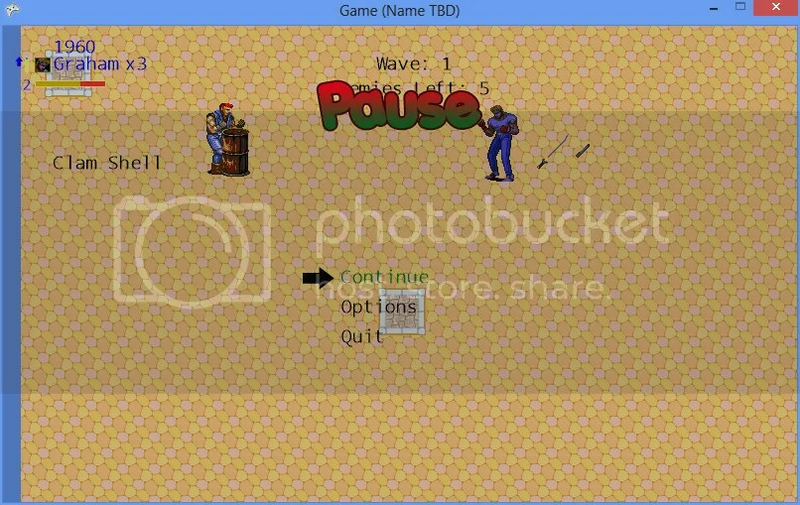 In short, it’s called a Bonus Status, and it grants the player a positive status effect when the player performs well. The main inspiration for this was one of my all-time favorite Beat ‘Em Up games, Spider-Man and Venom: Maximum Carnage for SNES (there is a Genesis version too but I think they’re mostly the same). They have a special bonus move called a Power Hit, which is an extremely powerful attack, and it procs when the player has high hit accuracy and doesn’t get hit too often. Your health bar will blink faster as you get closer to obtaining it. 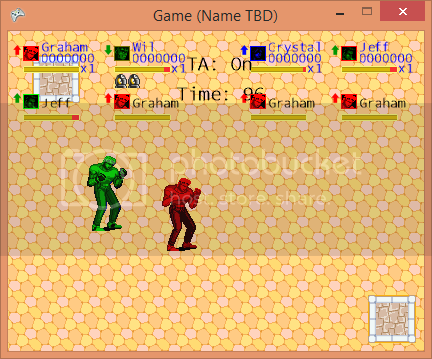 So, I implemented something similar that will better utilize Status Effects in my game. I always thought that something was lacking in the core gameplay, and I knew it had to do with Status Effects because those are the main unique features in Streets of Peril that influence combat. How it works is the following: every time you kill an enemy, you get closer to obtaining the Bonus Status, and every time you take damage you get further from obtaining the Bonus Status. When you’re close to reaching it, a small generic Status Effect icon will appear above your Status icon (or where it would be if you have no Status Effect) and start blinking. As you get closer by killing more and more enemies, it blinks faster until it finally stops blinking, in which case you’ll receive a positive Status Effect. If you currently have a Status Effect when you’re supposed to receive it, it’ll be put on hold until your current Status Effect is finished. You don’t know which Status you’ll receive until you get it. I don’t want to go into all of the details regarding which Status Effect you end up receiving, but the Status Effect the enemy you killed currently has and the possible Status Effects that enemy can spawn with heavily influence the choice. The Bonus Status icon on the upper left side of the screen. It is represented by a gray arrow. It is currently blinking, but you can’t see it because it’s just an image. I finally learned how to upload images onto WordPress! This is what it looks like when you already have a Status Effect and can’t receive the Bonus Status; the gray arrow remains above your current Status Effect icon until the current Status is over. Overall, I think it adds a little more flavor to the game and keeps things interesting by properly rewarding the player for performing well. I was always fond of seemingly-simple systems in games that have hidden complexity, so to have one of those in my game was icing on the cake (the cake being the feature itself, of course). Well, that’s all for now. Until next time! These are some early HUD designs for Streets of Peril. 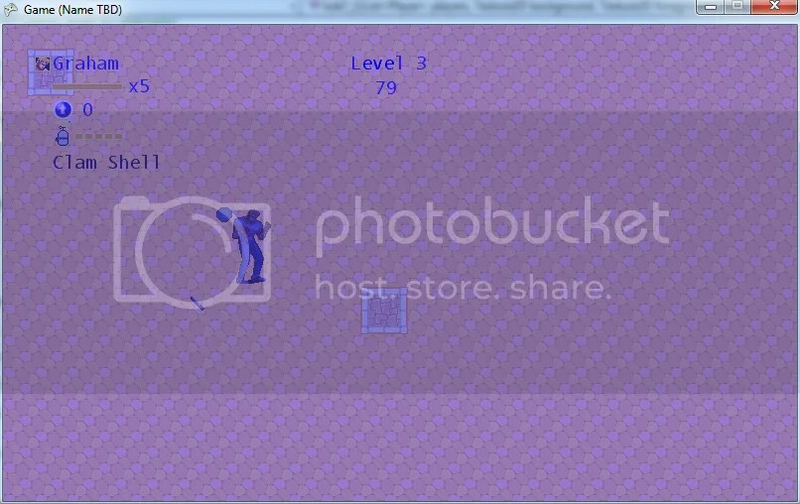 The first one shows the level and time at the top with player information on the left. The character icon and name are at the top with the health under them and lives to the right of the health. Under those are the current Status Effect, with its remaining duration under it, and the score to the right of it. The little icon under that is the character’s oxygen tank its health, which are present only in underwater levels. If your oxygen tank takes damage, it loses health; lose all of your oxygen tank health and you lose a life. Note the special icon for Status Effects: in this build, it would display one even if you did not have a Status so I ended up removing it because took up unnecessary space. The second picture is more recent; the score is at the top, with the character’s Status Effect, icon, name, and lives under it. Under those are the amount of times left to heal from a Healing Over Time (HoT) item and the player’s health. The “Clam Shell” text you keep seeing is the temporary HUD that displays underneath a player’s normal HUD when interacting with an object. The Clam Shell item grants the Defense Boost Status for 10 seconds, which explains the character’s bluish tint. 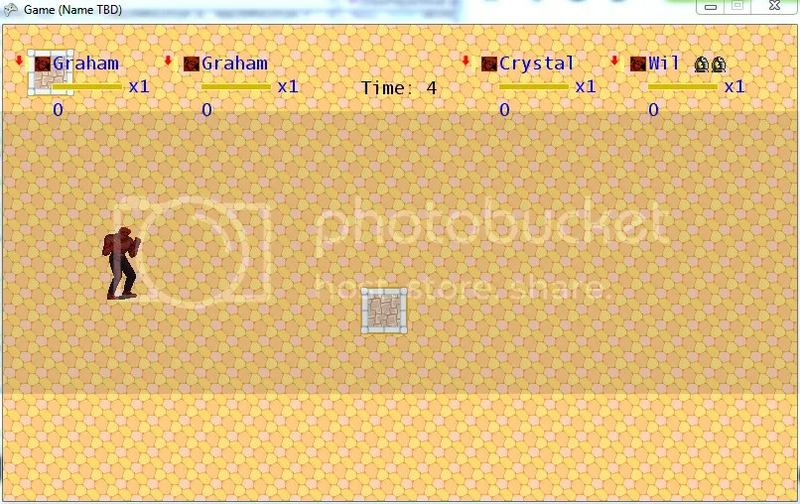 The third picture shows all 4 players on screen in Versus mode. The score and lives have again been moved down and Wil’s special Free Bullets are to the right of his name. Since Wil’s offensive and defensive special attacks involve the use of his gun, he is granted free shots that regenerate every minute or so without using a special. Any shots that hit enemies after they’re used up will damage Wil like special attacks normally do for every other character. One obvious thing you notice is that the window size is much smaller! Since this game is made in XNA, the default window size is 800×480, so I stuck with that for a good bit before finalizing other aspects of the game. The switch to this 416×320 size was rough to say the least. I was forced to utilize all the space I had as efficiently as possible, but the result was great in my opinion. Here we’re in Versus mode with all four characters. You may notice that there’s no bar showing how long a Status Effect lasts, and that’s because all of these Statuses will last indefinitely. If the Status Effects lasted a certain amount of time, the icons wouldn’t move and instead there’d be a small bar under them like in the third screenshot (which showed the bars even with indefinite Status Effects). The score has been moved underneath the name, and the character icon rests vertically in between the name and score. Wil’s Free Bullets have been moved underneath the health, and to the right of those would be the Oxygen Tank icon (which now turns more transparent the less health it has) and the number of times you have left to heal from a HoT item. The temporary HUDs now work properly and display more limited information when interacting with other players. Overall, I think this design is great, but it may need a little bit of tweaking in the future. You know, looking at all these pictures just shows me how far I’ve came. I’ve focused on so many small details, even ones that aren’t important at all or weren’t planned, and let my creativity run loose so I can deliver a polished, enjoyable game to players. Every little thing counts in game development. You may be tempted to ignore the little details, but putting just as much effort into them as the core mechanics and visuals differentiates good games from great games. Look at some examples of great games and you’ll see the same trend: Super Mario Galaxy includes an entire backstory that has nothing to do with the core game, but it gives it that much more charm; The Legend of Zelda: Ocarina of Time allows you to change the tone of the notes you play on your Ocarina when in reality you need only one (this gives players the freedom to do cool things like this: http://www.youtube.com/watch?v=lDN40Az8hQ0). The Halo series is famous for having super secret hidden Skulls and Easter Eggs which contribute little to gameplay aside from aesthetics and a sense of accomplishment (Halo 2 Scarab Gun, anyone?). It’s these intricate details that blow players away and show them how much effort you really put into your game. And we certainly know that people love it when they use something they know was made with love, passion, and devotion to the art. Game development is no exception, so if you’re an inspired indie developer, don’t compromise the quality of your product and make something truly great.